Our roof-top photovoltaic array has been running since the middle of August, 2003. At peak solar hours, we can feed 2.5kW back into the meter. The system is producing an average of ~13 kWh/day - quite a bit more than enough to fuel our 40 mile/day commute EV. We now truly have "free gas." 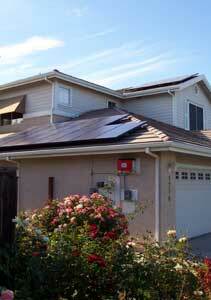 Inverter: SMA America - SWR2500U-SBD "Sunnyboy"
In Jan 2014, my system is now 6.0kW of solar wonder. Compliments of Sustainable Solutions Partners. Our first year of generation came to a close on July 31, 2004. We did better than expected! Our average production was about 400 kWh/month. After one year of living in the house and a year of driving 13,000 miles in the Rav, we had a net excess of electric credit. In fact, we not only left a $25 power credit on the table, we also left the $65 of minimum charges on the table as well. That is $90 worth of energy credit that we effectively handed over to PG&E for the privilege of being part of the solution. That $90 is about 2.5 months of power for us these days! Next year I won't be so stingy with the AC! Of EV interest - I also kept track of the power that our charger used, relative to the miles driven in the Rav. I show 3.5 miles/kWh from the outlet. Now we have used some public and other private charging, but then we have also offered up some power to other drivers. On balance, this number is probably a tad generous because of our off-site charging - but only by six or seven tank-fulls during the year. Let's call it 3 miles/kWh so as not to exaggerate. (yes, we used more power than we produced, but since we sold expensive on-peak power back to the grid, and used most of our power during the cheaper off-peak periods, we ended up with a credit). Lest you think that we use power like it grows on trees, please understand that saving energy (and that does NOT just mean electricity!) is a hobby of mine. I go through great lengths to save energy - often spending much more money than I will ever recoup on a simple monetary basis. Our windows are tinted, many have shade screens and awnings. I have a solar-powered attic ventilation fan, and we have a whole-house fan that is used instead of AC most days. 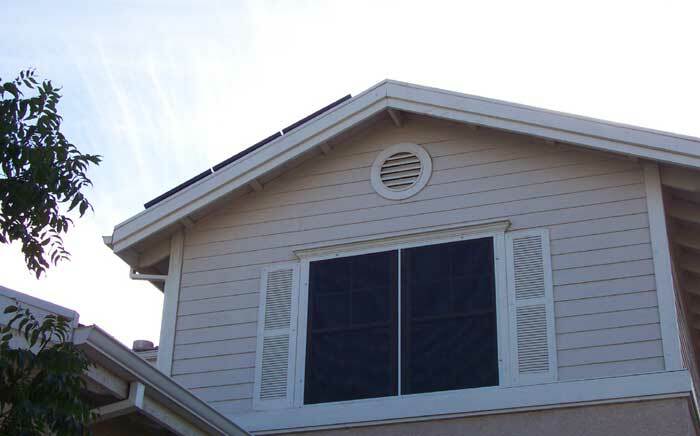 We air the house out during the cool nights, and seal it up tight during the hot days. We have ceiling fans in almost every room. Most of my in-town trips are made on bicycle. The longer trips that require a vehicle are strung together to reduce mileage - and driven almost exclusively in an EV. The family showers are done back-to-back when possible to avoid wasting the heated water in the plumbing. We cook outside on the really hot days (BBQ, toaster oven, grille). Almost nothing is powered during peak times (TV, computer peripherals, freezer, chargers for the electric lawnmower and trimmer, etc are all disconnected from power during peak times). None of my house lighting is incandescent - either LED or fluorescent. I can walk around the house at night without ever turning on a main light because I have about 3W worth of LED night lighting that is placed in relevant locations throughout the house. We use a horizontal-axis washing machine and we hang our laundry out to dry when possible. The list gets REALLY long and boring in a hurry - but you get the idea. The overview from the South side. Garage door on the right faces the street. Upper panels are hard to see at this angle. There are six panels on top, 14 below - joined as two strings of 10. I have since removed the E9B meter, and the entire house is on E7. Reasoning is at the bottom of this page. From the front of the house, you can barely tell the system is installed. Here is a shot of the upper panels from the sidewalk. The lower panel array is not visible from the street. 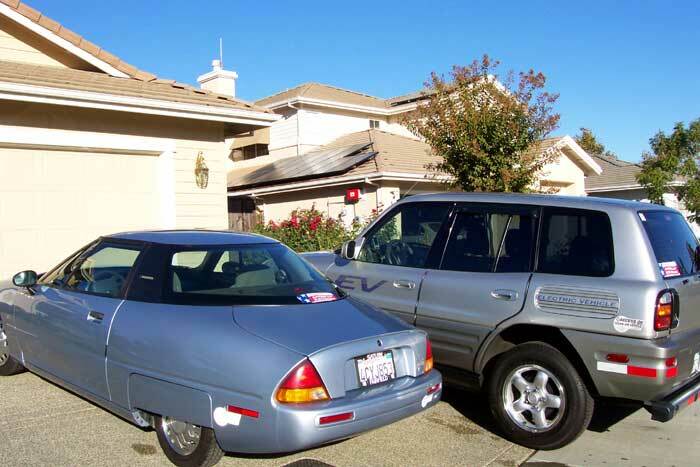 And finally.. both clean cars parked in view of the panels, one month before GM yanks back the EV. Still managing over-production after 2.5 years. March 7, 2005. 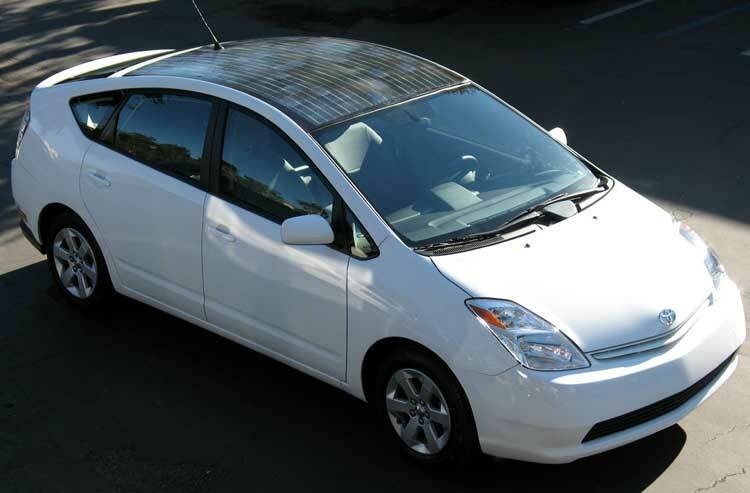 Greg Johanson of Solar Electrical Systems has designed this solar Prius roof and is contemplating a similar solution for the Rav. Dimensions: 31.1" x 62.5" including the frame. ~13.5 sq ft for each panel, or 270 sq ft for the whole enchilada. If I had a gable roof (instead of hip) on the garage, all 20 panels would have fit on the South slope of the garage roof. So... one side of the garage roof to power our main vehicle AND our entire home. How great is that? Why aren't we funding THIS instead of our Hydrogen Highway? Q: How much land area would it take to provide the electricity needs of the entire USA? A: 10,000 square miles (a square that is 100 miles on each side). 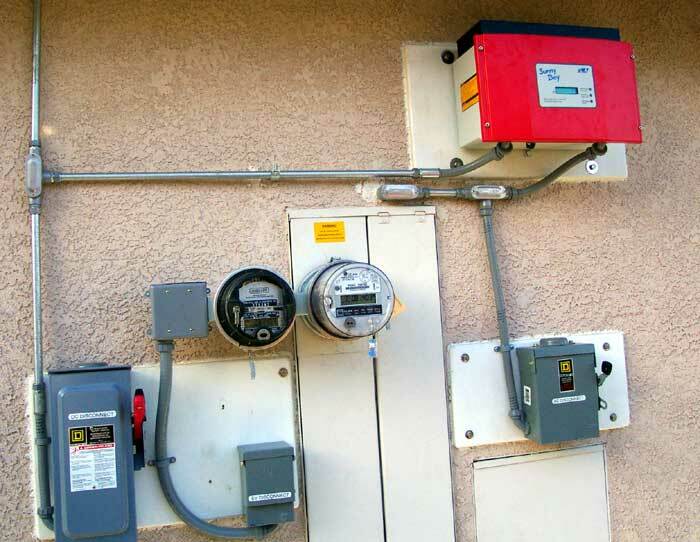 The solar energy falling on a square foot in Arizona averages close to 0.6 kWh per day, 16,727,040 kWh per square mile. 100 x 100 miles and 12% efficient solar power, works out to 2 x 10^10 kWh/day And the US electrical consumption is roughly 1 x 10^10 kWh/day (about half of what this example solar array would produce). That's a very large land area, but not so bad given perspective. Solar energy, at 12% efficiency, turns out to be a pretty good deal overall as a renewable energy source. I paid $277 to have the new meter installed initially, and there is a "meter charge" of $0.0427/day, or $1.30/month on top of that. 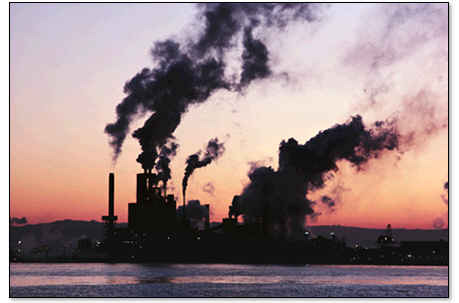 The minimum energy charge is $0.16427/day, or about $5.40/month. This I have to pay if I do not use at least $5.40/month of grid power. In one year, that minimum charge totals about $65 - and I have to use $65 of power or lose the money. 0.3130 / $7.30 E9 meter charge = 233 kWh/mo that would need to be purchased to break even with the meter charge. In 22 months, we have used 4240 kWh to charge EVs. 4240 / 22 = 193 kWh/month we have used. Not enough to justify the E9 meter charge! And I haven't yet introduced the other issues like the TWO minimum energy charges that I'd have. E7 is the answer for me. E9 has many hours of darkness in the peak time, and those hours are heavy use times for us (making dinner well before 9pm). E7 also adds peak time at noon - the best generation time. Since I get more credit for the power, and I get more sun during the peak time, E7 wins again. Why whole-house E7 over E9A? Should be obvious by now, but here's another little bit of math: E7 allows two more hours of peak generation/weekday (because of the noon peak start), or ~80 peak kWh/month. Counts for (2.33 - the ration of the average E7 peak/off peak X 80 hours) = 186 off-peak consumption kWh/month that E7 provides over E9. E9 also has more peak consumption because of the 9pm end of peak that crosses into dinner. 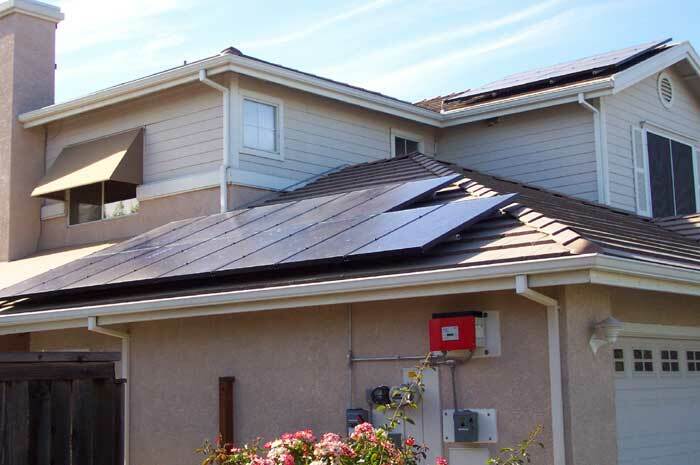 The "payback period" is one erroneous way of looking at the cost of putting in a solar system - it is a quick way to turn off prospective buyers. 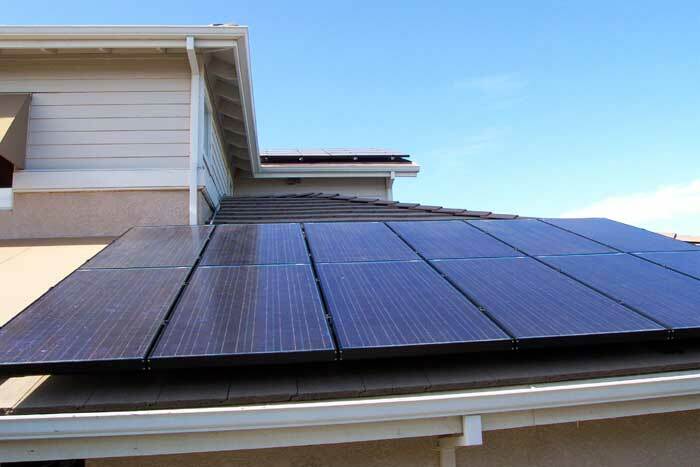 Solar electric involves a large up-front cost recouped by many years of savings on electric utility bills. Usually, the "payback period" is defined by the time required for the energy savings to add up to the initial cost of the system - maybe 8 to 12 years. This false image is a sure way to keep PV out of favor. A better way is to look at the Return on Investment (ROI): each $14,000 in homeowner cost ($20,000 before rebates) produces about $1000 in electric each year, a 7% ROI. And from the start, the purchaser is ahead of the game by the rebate cost, an immediate 30% windfall. Solar investment cost goes onto your roof in saleable hardware instead of going away on monthly utility bills. Utility bills are paid for by after-tax money, so freeing up $1000 per year for each $14000 solar investment frees up as much as $1400 in pre-tax income that can be applied to 401K or other uses. And if you finance the solar system on your home loan, you may be able to deduct the interest payments. And what if some of that electric power can also be used for DRIVING, and you can REPLACE GASOLINE with power you make on your own roof? As an example, our solar system (2.5 kW, about the smallest residential system that is practical) produces enough peak-power electric credits to "pay" not only for our household electricicy usage, but allows us to drive our EV more than 1000 miles/month. Our system cost about $11,000 after rebates, and allows us to save $70/month in household electricity usage, AND save about $150 in gas to power our main car. The payback period for using a solar system to pay for expensive gasoline is 1. PEACE OF MIND, and 2. less time. With an average car travelling 1000 miles per month, you use 50 gallons of gasoline, or $150 at current rates. To go 1000 miles in an EV takes only 250 kWh of electric power in a RAV4-EV (less in an EV1), or the energy equivalent of less than 8 gallons of gasoline (35 kWh to one gallon of gasoline). Pretty nifty, to get to keep the after-tax $150/month that you formerly had to spend on gasoline, and also the $70/month you formerly paid to the utility company. Some great residential information (after a lengthy personal installation story) can be found here. Amazing to me is that some folks think PV installations are a blight. I have to wonder... are PV panels really uglier than the more traditional ways we get energy?